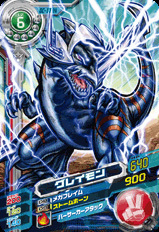 A Tyrannosaurus-type Dinosaur Digimon. 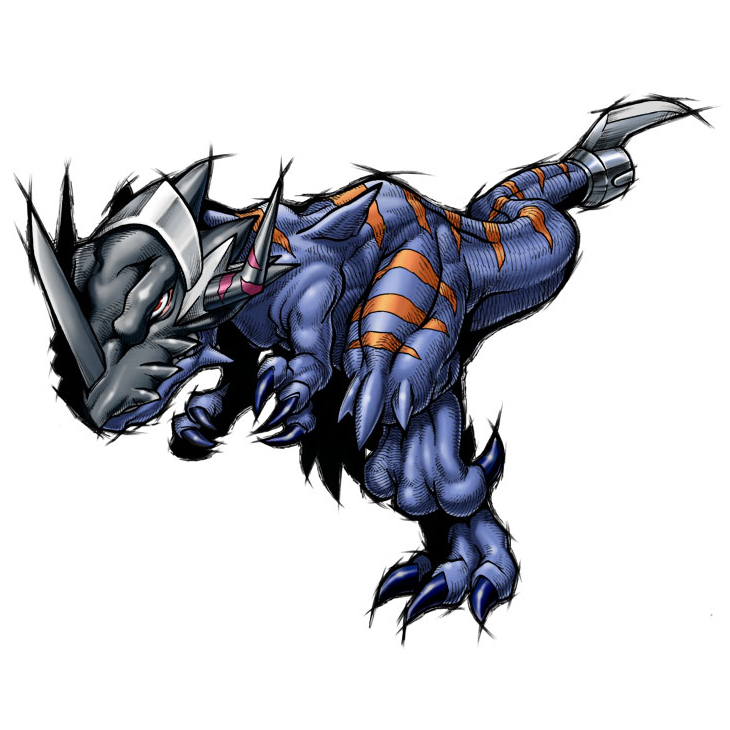 As a Digimon specializing in offensive power, its combat instinct is extremely high, and its cruel, brutal nature is such that it will not stop battling until it annihilates the opponent, so ordinary Digimon cannot even approach it as they are repelled by the abnormal fighting spirit it exerts on its surroundings. Its "Mega Flame" is a jet of flames that burns its surroundings to cinders, and its "Blaster Tail" allows it to strike enemies from any direction within 360° of itself. 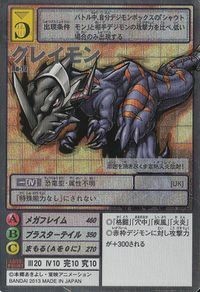 It possesses "Horn Strike", an effective assault technique for both approach and retreat, and it displays its especially tremendous fighting strength alongside its sturdy body in close combat. 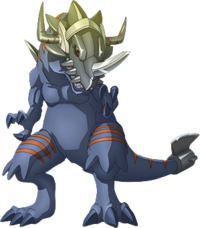 Not only does each of its techniques possess immense destructive power, it is also said to be almost impossible to hit Greymon in close combat due to its quick movements. 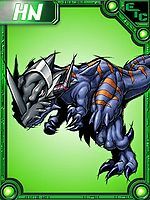 Because it is merciless towards even members of the same species, using Greymon cannot be said to be anything but difficult. A blue trump card! 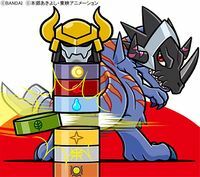 A brutal Destruction Digimon! 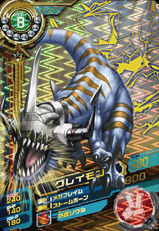 A Tyrannosaurus-type Dinosaur Digimon. 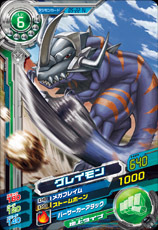 As a Digimon specializing in offensive power, its combat instinct is extremely high, and its cruel, brutal nature is such that it will not stop battling until it annihilates the opponent. 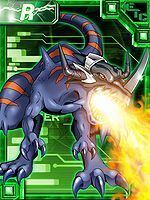 Its "Mega Flame" is a jet of flames that burns its surroundings to cinders, and its "Blaster Tail" allows it to strike enemies from any direction within 360° of itself. It possesses "Horn Strike", an effective assault technique for both approach and retreat, and it displays its especially tremendous fighting strength in close combat. adj., Meaning old or ancient. 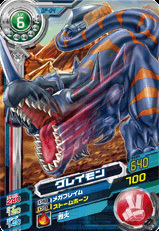 Blaster Tail  ブラスターテイル Burasutā Teiru Atomic Tail Slams its tail into the ground to cause an explosion. Charges the enemy, stabbing them with its horn. 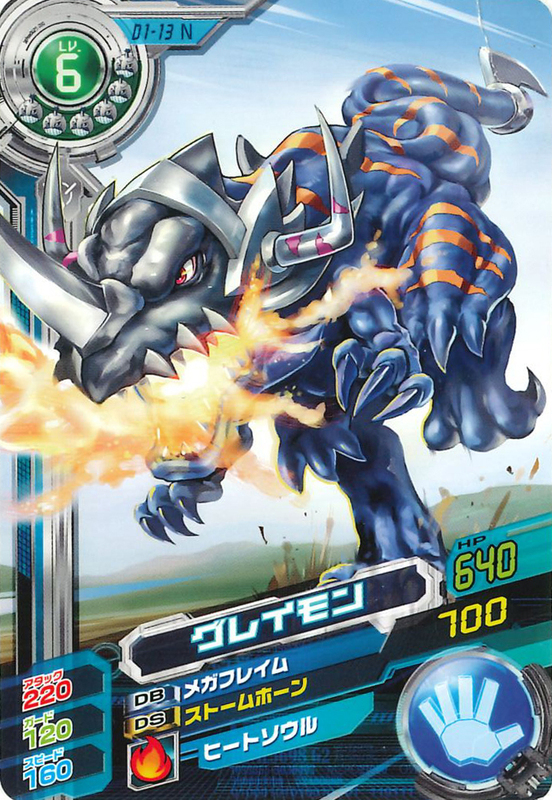 Greymon from Digimon Xros Wars using Mega Flame. 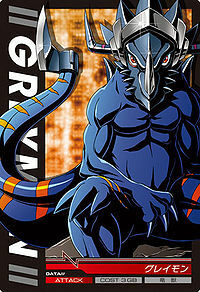 Greymon is the partner of Aonuma Kiriha and a member of Blue Flare. Its super-heated Mega Flame burns the whole area down! 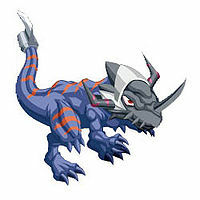 A ferocious Digimon that Aonuma Kiriha controls. It is proud of its tremendous power, which is capable of destroying everything. A Digimon that possesses tremendous power. It unleashes a powerful flamethrower from its mouth, which destroys all surrounding enemies in one shot. A Digimon who loves to battle. Its Special Move is "Blaster Tail", where it gathers energy at the tip of its tail and strikes with it, causing an explosion. 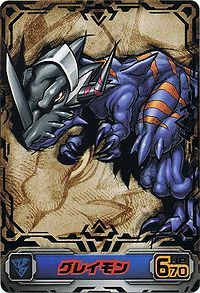 An offense-oriented Digimon that hides overwhelming power. 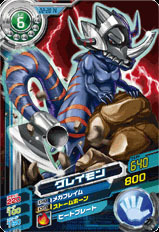 Thus far, it has fought many intense battles with the Bagra Army using that power it possesses. 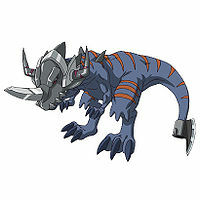 A Digimon with a tough body and tremendous attack power. With its brutal personality, it fights with merciless attacks until it defeats its opponent. 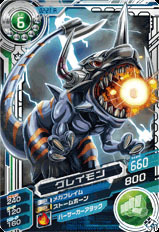 A Dinosaur Digimon with a ferocious personality. 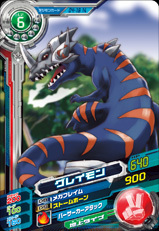 It possesses extraordinary battle instincts, as well as overwhelming attack power and nimbleness. 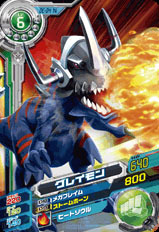 Greymon's Special Move, Mega Flame, involves it breathing high-temperature flames from its mouth and incinerating everything in its surroundings. It possesses brutal battle instincts, and will continue to battle with its tremendous destructive power until the opponent Digimon is annihilated. 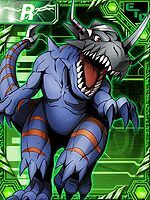 A dinosaur-like Digimon that loves to battle. Nobody can stop it once it starts to run wild. 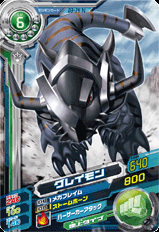 A Digimon that hides tremendous attack power in its huge body. Even if the opponent gives in, it will not stop fighting until the opponent is completely destroyed. 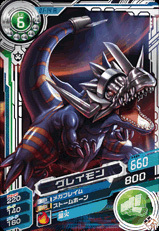 A Dinosaur Digimon that possesses tremendous power. Although it has a brutal personality, it is only loyal to its master Kiriha's orders. 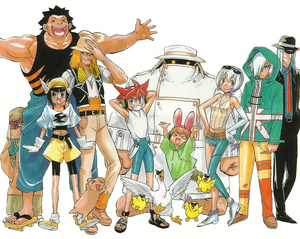 The Digimon that acts as Blue Flare's main fighting force. 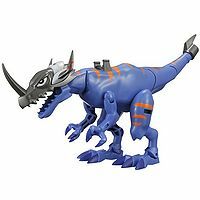 It has great battle capabilities due to its sturdy, sharp body and its swift movements. It has a brutal personality, and will not go easy on anyone no matter the power difference between them. 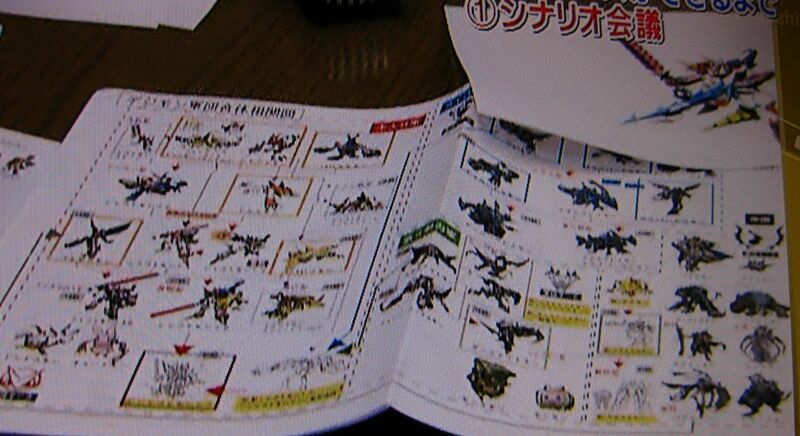 ↑ Super Digica Taisen: "Second Act DigiXros Units"